There’s a new trend in social networking, coined ambient social networking at a South by Southwest conference. It’s been in the works with new technology, gadgets and social networks coming out every day. What exactly is ambient social networking, and where did it come from? The term can be used in conjunction with SoMoLo, or social, mobile and local. SoMoLo refers to social networks, mobile devices and local-based intelligence affecting the way we purchase. We use Facebook and Twitter to tell our friends and followers what we have bought, and what they should buy. In turn, we get product recommendations and restaurant tips from Pinterest and Foursquare. Smart phones are now an integral part of many purchases, as we can check out phones to compare prices and see if items are in stock. Local also refers to consumer location. Social networks that tag your location such as Instagram, Foursquare, and Snapchat are extremely popular. Facebook and Twitter recently added geo-tags to its posts so you know where your friends are tweeting and posting from. Many restaurants, department stores and hotels have picked up on this trend by adding deals when you check-in via Facebook, Foursquare or Yelp. All of this interconnected activity leads us back to ambient social networking, or sharing without all the extra work. The possibilities for applications like this are endless. They could be used as a way to make new friends or a location-based dating application. Many have criticized our growing addiction to technology as isolating, but I tend to disagree. The drawbacks of ambient social networking are over sharing and lack of privacy. People you don’t know will know your location and have a way to get in contact with you. In addition, all the extra information could lead to burnout and deactivation. 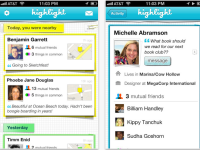 Do you think ambient social networking will catch on, or do you think privacy concerns will get in the way?